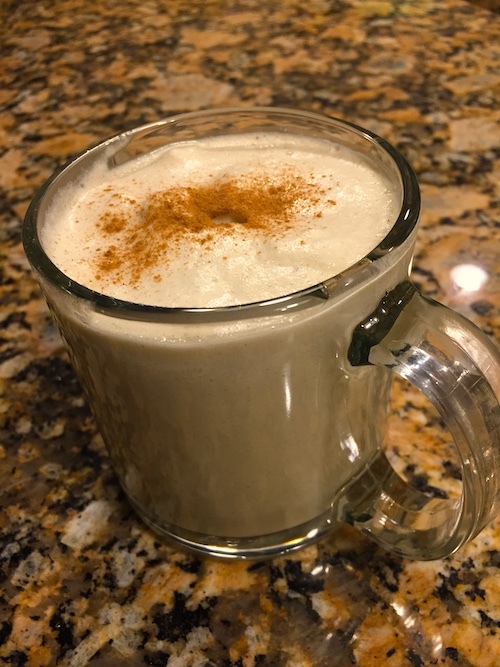 Luscious, and very similar to store-purchased egg nog…without all the fillers and carbs. Return everything to the saucepan, and cook over medium/low heat for roughly 8-10 minutes, or until your mixture reaches 160°F/70°C and coats the back of a wooden spoon. Remove from heat and sieve onto a medium mixing bowl. Stir in vanilla and liquor of choice, to taste. Cover and transfer to the refrigerator to chill. Your eggnog will continue to thicken while chilling. So give it a good stir right before serving, and feel free to thin it out with a little nut milk until desired consistency is reached. Add nut milk, cream, cinnamon stick, and nutmeg to a saucepan and simmer for 10 minutes. Set aside. Combine egg yolks and sweetener in bowl. Whisk until light and fluffy. Temper the hot egg/sweetener mixture by adding the hot milk very slowly to the egg yolk mixture, whisking constantly. Return the egg nog to the saucepan, and cook over medium heat for 10 minutes, or until nog reaches 160 degrees and coats the back of a wooden spoon. Remove from heat and sieve into a mixing bowl. Store in vanilla and rum. Cover and refrigerate. To serve, stir well and sprinkle with cinnamon or nutmeg. *Yacon syrup is low on the glycemic index, because about half the carbs are indigestible fiber. The flavor is in the caramel direction, so it’s delicious in this recipe. This entry was posted in Beverages on December 4, 2018 by Blackberry Season.